Morgan and I visited this historic site on Saturday. 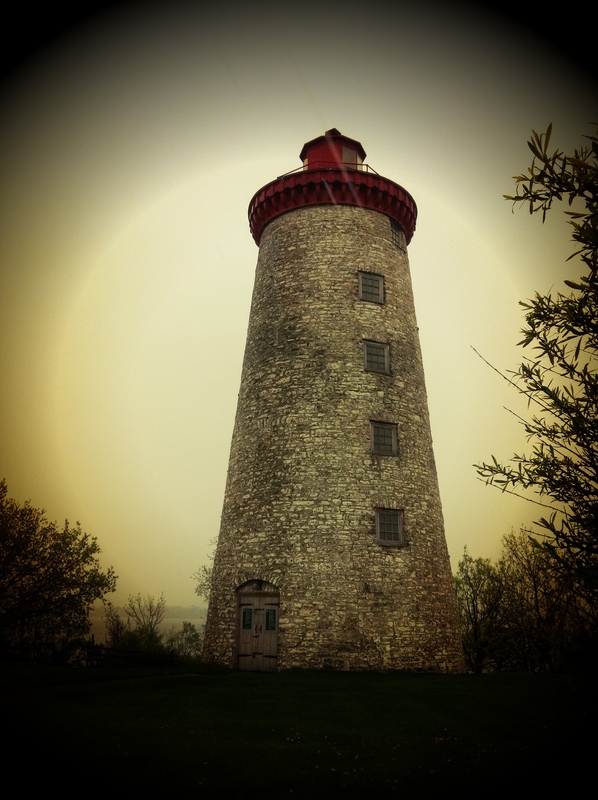 It looks like a lighthouse now, but it was a windmill in 1838. The site of a battle between two different ideologies: British patriots and anti-British rebels. On November 12, 1838 around 250 “Hunter Patriots” (a reportedly neo-Masonic organization who was intent on getting the British out) came across the St. Lawrence River to attack Prescott. The Hunter Patriots, failing to take Prescott, moved downstream about two miles of Prescott and captured the well chosen Windmill. Here a man by the name of Nils Von Schoultz, was appointed to command the Hunter Patriots, while their commander went back for reinforcement. After a four day standoff, and the arrival of the Royal Navy gunboats and heavy artillery, Hunter Patriots unconditionally surrendered in November 16, 1838. These men were taken to Kingston: eleven of the leaders, including Nils Von Schoultz were executed; 60 men were sentenced to Australia; 126 were freed. We used to have a British soldier’s uniform in the basement that a family member had fought in during the Battle of the Windmill. I believe it was given to a museum-I’ll have to check. Only four years later after this event would Hales Cottage (the family home) be built, and Aunt Mary and Aunt Lizzy move to Hales Cottage 2. Kingston would be given the title of Capital of Upper Canada, only to have that title taken away again. When we visited yesterday, it was raining. A lonely stone sentinel of the past greeted us. Nothing to be heard except calls of birds, howling of the wind and the splash of rain. A chasm of change now separates us from the skirmishes of the past. A child might mistake it for Rapunzel’s tower. This entry was posted in children, historical, history and literature, Kingston, primary resource, spirit, Thoughts and tagged Battle of the Windmill, change, history, Kingston, lighthouse, photography, Prescott, time, tower. Bookmark the permalink.